For the past few years fingerprint scanners were considered to be a very costly and high end technology. We have seen it only in thriller and sci-fi movies. But now, these devices have been popping up in almost all places like offices, police stations and also our laptops. 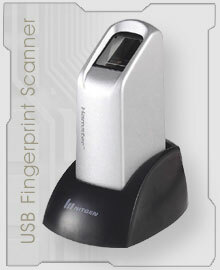 You also get to buy fingerprint USB scanners for almost $100. In this post we will learn the use, applications and also the working of fingerprint scanners in detail. Suppose you have a fingerprint scanner enabled laptop. You need to visit a site which you havenâ€™t seen for a long time. You even forgot the password to see your own profile. Thus you will have to get a new password by entering your e-mail address. All these problems can be solved by using a password storing fingerprint reader. The main thing to do is use the same password and user-name for all websites that you use. Store the password in the fingerprint scanner software. Scan your finger with the help of the device and store it in reference to the password and user-name you have provided. Thus, when you visit the site again in future, all you have to do is swipe your finger on the device and the associated user-name and password will be filled automatically to the site. The scanning procedure can also be used for identity recognition as well as locking and protecting your computer files. This identification device has been commercialized from the late 19th century. The device is the most popular among all the identification devices because of its ease in acquisition, and also the number of sources that are available for its data collection. It has found its vast use in law enforcement and immigration purposes. 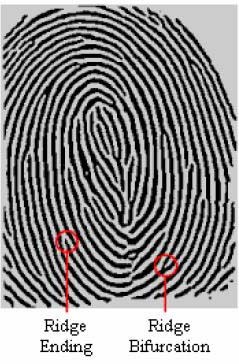 The basics of this identification process comes from â€œGalton pointsâ€ â€“ a certain characteristics defined by Sir Francis Galton, through which the fingerprints can be identified. The exact automation of this technology began in the year 1969, when the FBI wanted an identification system using fingerprints. For this the FBI made deals with the National Institute of Standards and Technology (NIST), to make developments on the searching, matching as well as scanning process. For this, the NIST worked with the minutiae technology, which is actually a smaller version of Galton points to develop the fingerprint scanning technology. The two main problems they faced were extracting the minutiae from each fingerprint and also comparing, matching and also searching the lists of minutiae from large list of fingerprints. The best prototype was first exhibited in the year 1975 by the FBI. A capacitive scanning technique was used as its working basics. More work on making automatic digital inked fingerprints, compression of the image and so on is still being done. Before going in detail about the technology used, it is very important to know about the basics of our fingerprints. The basic information about fingerprint is that it is unique for each person. Even a twin brother will not have the same fingerprint. Thus each fingerprint is used to store a unique identifiable piece of information. The uniqueness in each fingerprint is due to the peculiar genetic code of DNA in each person. This code causes the formation of a different pattern of our fingerprint. A fingerprint consists of ridges and valleys. They together provide friction for the skin. The main identification of the skin is based upon the minutiae, which actually is the location and direction of the ridge endings and splits along a ridge path. The image shown below represents two types of minutiae. Take a look. 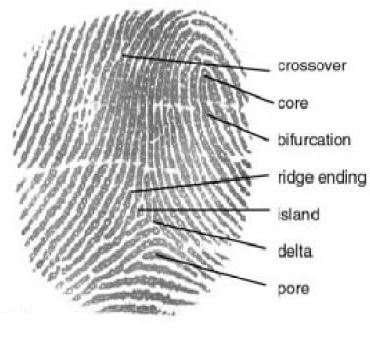 The image below shows all the other characteristics of a fingerprint. These characteristics may also be helpful during the process of minutiae extraction. Take a look. The unique information used for the identification includes the flow of the friction ridges, the sequence and also the presence/absence of the individual friction ridge path features. There are mainly two types of scanning methods for this technology. Either an optical or capacitance scanner is used to scan and make a picture of your finger. Though both the methods produce the same type of image, the making of it is completely different. This scanned image is then compared with an earlier existing finger print of yours to get the correct identity. The comparison is carried out by the processor and the comparison is made between the valleys and ridges. Though the steps are simple, very complex algorithms must be carried out to perform this operation. Though your whole fingerprint is recorded, the computer takes only parts of the print to compare with other records. The main part of an optical scanner is the Charge Coupled Device. To know more about it click on the link below. The electrical signal created in response to the light hitting on the CCD forms pixels which are collectively joined to form an image. These pixels are converted using and ADC to make a digital image. The scanning device consists of a glass plate, on top of which you are supposed to place your finger. After the scanning takes place, an inverted image of the finger is stored. This image will show the ridges and valleys of your finger. The ridges can be spotted by the darker areas where the light reflection is greater. The valleys can be spotted by the lighter areas, where the light reflected is lesser. The scanner is also designed to recheck the image captured. The scanner checks whether the image captured has an satisfactory pixel darkness. If a problem is seen in the checking process, the image will be rejected and the suitable adjustments will be made so as to get a better quality picture. After all these procedures, the image will be compared with the existing stored images. The figure of a simple capacitance sensor is shown below. Take a look. The principle of capacitance is used in this device. As shown in the diagram, each sensor consists of arrays of cells. These cells have two conductor plates, which are covered with an insulating layer. Thus, they form a simple capacitor which is used to store the charge. The cells are so small that their actual size will be smaller than the width of a ridge from our finger. These sensors will then be connected to an integrator. The output of the integrator will be given to the input of an inverting operational amplifier. This op-amp will consist of hundreds of transistors, resistors and capacitors. Â This op-amp is alters the input voltage with respect to the reference voltage provided to the other input. The non-inverting input is connected to the ground. The inverting input is given to the reference voltage and then to the feedback circuit. This feedback circuit is given to the amplifier output and also includes the two conductor plates. When the finger is placed for recognition, it acts as another capacitor plate. It is separated with the help of insulating layers. When moving the finger from one point to another, the capacitance changes due to the variation in distance between the capacitor plates. Thus, the output voltage is recorded with the change in output voltage according to the appearance of ridges and valleys. A perfect output image of the fingerprint is thus obtained. This device is much better than an optical scanner as it is very compact and harder to trick. The device needs a real fingerprint shape to get the output. The optical scanner a dark and light pattern is more than enough to make an output image. Though an optical scanner needs CCD devices for sensing, a capacitance scanner needs only semi-conductor chips. You are actually able to provide a physical evidence of yourself. This type of an identity cannot be easily faked like identity cards. Though you can guess a password of another person, it cannot be done so in the case of a fingerprint. You may lose your identity card. But, you are not going to lose your fingerprint. The same will be the case of a password. An optical scanner can be fooled by showing a picture of a finger instead of a real finger. Capacitance scanners can also be fooled by swiping a mould of a finger by including ridges and valleys. If it is some serious business, a thief could also cut-off the personâ€™s finger and swipe it on the scanner. If you have misplaced your credit card you can easily get a new one. But, if someone has moulded a same fingerprint as yours, there is no way to replace it. noot tyis submit iss written via him as no one else recognize such designated about my problem. Plz provide abstract for finger print scanner.I am selected this as my seminar topic. Excellent, just starting on a project that uses fingerprints as a controller device – this gave me good insight into how it works! i really appreciate the knowledge, it is very effective and it gives me sufficent knowledge about finger print scanner . i am thankfull to you. Engineer,I really appreciate you for the knowledge upliftment you are giving me.But I still want to implore you to be giving it to me regularly,that is everyday.Thanks!